With this system, Hexagon Metrology offers a complete multi-sensor package in the mid-price range: the tactile LSP-X1 High-Speed Scanning Sensor, touch-trigger probes, a variety of optical sensors and the optional Dual Z-Design. The new Optiv Performance 443 provides users with a precision system for an affordable price. The device is capable of both contact-less and tactile measurement procedures. The comprehensive options package includes tactile scanning, touch-trigger probes, vision sensors, chromatic white light and through-the-lens lasers. As the only machine of its class, the Optiv Performance 443 can be provided with the exclusive Dual Z-Design from Hexagon Metrology. The Dual Z-Design involves two vertical Z-axes which can be moved independently of one another. One axis is intended for optical sensors, and the other holds tactile sensors. While the tactile sensor is taking measurements, the axis with the optical sensors is located outside the measuring range. 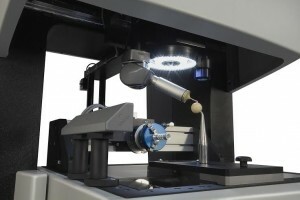 As a result, there is plenty of space for any type of sensor to be used with the measuring machine. The Optiv Performance 443 Dual Z can thus, for example, be combined with the TESASTAR-m (motorised indexable head for probes) and the LSP-X1 High-Speed Scanning Sensor. Any feature can be effortlessly achieved with this Leitz-branded sensor, which is also part of Hexagon Metrology. Shapes and contours can be measured quickly and very precisely. With conventional multi-sensor systems, optical and tactile sensors are attached to a single axis. This limits the amount of space available. For example, the use of tactile probes on motorised indexable heads is not possible with conventional multi-sensor measuring machines. The software used with the Optiv Performance 443 is PC-DMIS Vision, the origins of which reach back to tactile measurement technology. PC-DMIS Vision contains all the functions required for tactile and optical measurement. The software supports tactile single-point measurements, tactile scanning and camera measurement, to name a few examples. The new Optiv Performance 443 is ideal for both the measuring room and use on the shop-floor. It is now available at all Hexagon Metrology commercial operations in the EMEA region.